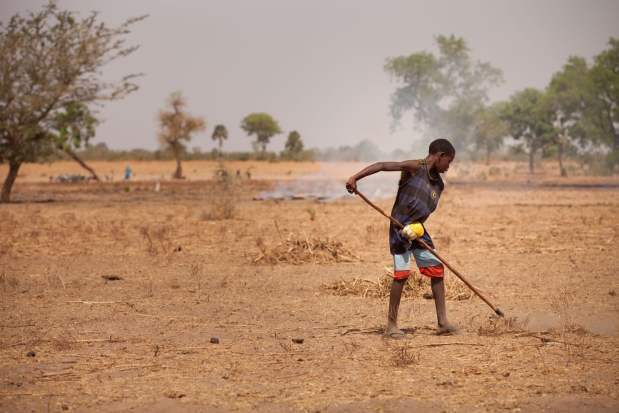 Land degradation, a reason for rural people to migrate, is a prominent problem in Senegal. Photo: M. Mitchell/IFPRI. MONTPELLIER, France , Oct 11 2017 (IPS) - We are at a moment of huge opportunity in the world’s food system. We can continue on our current trajectory of consuming too little, too much, or the wrong type of food at an unsustainable cost to the environment, health care and political stability. Or we can change course. Fixing the food system will help solve humanity’s greatest challenges – creating jobs, reducing emissions, and improving health. Worryingly, new research shows that after a prolonged decline, world hunger is on the rise again, with some 815 million people acutely or chronically undernourished in 2016, up from 777 million in 2015. A further 2 billion people suffer from micronutrient deficiency, also known as ‘hidden hunger’, whose effects can be damaging for life. In what seems to be an absurd twist, another 2 billion people are overweight or obese. Food insecurity is a contributor in what has now become one of the world’s most vexing problems – that of forced migration. This year’s World Food Day takes the theme of migration, and the importance of investing in food security and rural development so that people no longer have to uproot their lives and take often perilous journeys into the unknown. The 21st century is proving to be an epoch of massive human displacement, with people leaving their homes and their homelands at a greater rate than at any time since World War II. Conflict, hunger, poverty, and an increase in extreme weather events all play a part in fuelling instability and driving forced migration. In 2015, there were 244 million international migrants – 40% more than in 2000. Between 2008 and 2015, an average of 26.4 million people were displaced annually by climate or weather-related disasters. In the same year, 65.3 million people were forcibly displaced by conflict and persecution. Changing trajectory is possible, and will take a huge effort involving governments, civil society, companies and scientists. It is imperative that we rigorously engage with local scientists and research partners, who know best the conditions where deprivations are greatest, and on what emphasis should be placed. Simultaneous transformations in genomics, big data, communications, markets and understanding of nutrition can be harnessed to benefit the people who most need them. 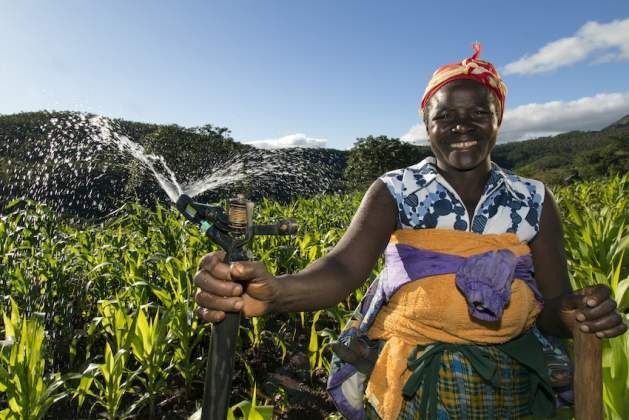 Water availability and improved water management can significantly help smallholder farmers produce more and better food, as this farmer shows in Eastern Highlands on the Mozambique border, where she uses a sprinkler system to irrigate her farm. Photo: David Brazier/IWMI. It is impossible to overstate the importance of agriculture and agri-business as an engine for growth and a contributor to stability. As the world’s single largest employer, agriculture provides livelihoods for 40% of the population –78% in developing countries – so advances in this sector will have a powerful knock-on effect on national economies and the prosperity of local communities. During my first year in CGIAR, I had the honour of seeing first-hand some of the inspiring and remarkable initiatives being undertaken by scientists in our 15 Research Centers across the globe, who are committed to finding and sharing new innovations to help successful agriculture catalyse successful rural economies. To feed a population that is expected to exceed 9 billion by 2050, our scientists are pioneering improvements in crops, animals, fish and trees to increase performance, nutritional value and resource use efficiency, and are building resistance in plants to drought, increased salinity and disease. Each year, around 200 new crop varieties with improved characteristics are released globally through CGIAR’s partners, with which we work closely to bring about transformation on the ground. For example, CGIAR researchers have designed a field diagnostic tool kit for caprine pleuro-pneumonia, a deadly disease that causes major economic losses to goat production in Africa and Asia. In large swathes of South and Southeast Asia, 5 million farmers have seen their fragile livelihoods safeguarded by the introduction of flood tolerant rice, while in 13 countries of Sub-Saharan Africa, the adoption of drought tolerant maize is estimated to have produced total benefits of US$395 million. Nutritious biofortified varieties, including vitamin A enriched cassava, maize and sweet potato, as well as iron beans, iron pearl millet, zinc rice and zinc wheat, are supplementing diets deficient in micronutrients that can cause irreparable damage, particularly in the first 1,000 days of a child’s life. While recent studies undoubtedly show the numbers of hungry people going in the wrong direction, there is strong potential for reversing this trend. Science can and is producing solutions to the challenges of hunger and poverty, so it is critical to support innovation and research that can harness global scientific advances to address local challenges. By 2030, the actions of CGIAR and its partners are expected to result in 150 million fewer hungry people, 100 million fewer poor people – at least 50% of them women – and 190 million hectares of less degraded land. That translates into real prospects for stemming the tide of poor and malnourished people on the move, offering them hope for a decent future without leaving home. Beat our swords into plowshares, our spears into pruning hooks. And close Wall St.